Studios of all sizes have released droves of innovative titles this year. Well into its twilight it continues to bring us notable games and has even relieved gaming’s long-running RTS drought. In addition to the updated StarCraft: Brood War and Halo Wars 2, the indie scene sent their own delegate in the form of Tooth and Tail by Pocketwatch Games. Unlike most real-time strategy games, the preferred input here is a controller. The player interacts not through a cursor but a flag-waving avatar. The faction leader navigates the map and scouts the procedurally-generated landscape. To prevent starvation and to expand their territory, the player builds Gristle mills and farms. Then, using the meat those produce, place warrens, which, in turn, spawn units they personally lead into battle. Matches are quick and chaotic as leaders rush into each other’s stationary defenses with several tiers of pixelated units. The formula is not so simplified that there isn’t depth to the combat, and it ticks all of the requisite boxes to make for a fun addition to the genre. The story mode explores the four major parties and questions the assumptions of campaign missions in interesting fashion, utilizing a minimalist approach to tackle nuanced factionalism. The player witnesses a story about a revolution unravel in four parts, beginning with the bourgeois Long Coats. Dressed in blue, they rise up after their leader’s son is picked to be cooked. The aim of their revolution is to excise the dominant class’s, the yellow-wearing Civilized, stranglehold on society and implement a meritocracy to determine who is eaten. The impoverished and Red-wearing Common Folk want democracy. The Green KSR, bureaucrats and full-time soldiers, desire peace and order. Once the fighting begins, each group falls into place accordingly. The player’s perspective changes as the story progresses, and explores each faction’s respective hub. There, they can interact with objects, speak with the locals, and instigate missions. 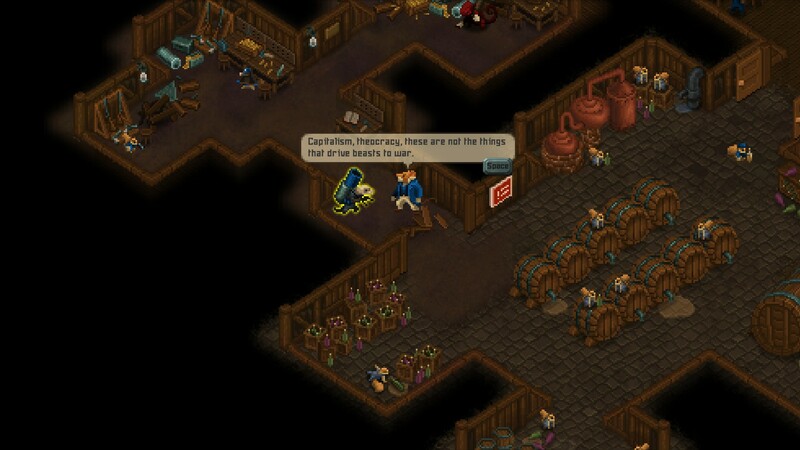 The introductory cutscene, featured in Tooth and Tail’s trailer, first drew me in, but it’s the dialogue in these hubs that intrigued me the most. There is little in the way of exposition as the conflict is in full-swing from the moment the game begins. The dialogue prompts serve as background and lore, but are not explicit in their descriptions. Instead they are conversations and observations that arise organically from the situation. Therefore, the circumstances are hazy and it’s the player’s job to investigate and derive conclusions. Why is every faction insistent on eating meat, unwilling to “eat like beasts?” Why are they ambivalent to the low-status of the pigs? Some questions are answered, others we can only theorize about. Not long into the game, the player uncovers the porosity of each faction. Canonically each unit-type hails from different backgrounds and alliances. The orn drinking squirrels, the Distillery Brothers, side with the Long Coats—except when alcohol is no longer sufficient payment. Volkov, the Drill Sergeant Wolf, in both appearance and behavior fits in with the KSR. But for long? Each mission has its own rules; the winning objective, how you collect meat, the weather conditions, and even the very units you can employ vary. Through this, the player engages different compositions with their own; some of these do not adhere to strict faction lines. Whereas the conflicts between groups are vital in many RTS’, never have I seen one where fundamental make-up of each group is tenuous, or one that grapples with the layered implications of that tenuousness. The writers have a strong command of character, and have practice with this type story-telling from their previous game, Monaco. Indie titles with budget and time constraints do not have the luxuries of triple-A in which they can dedicate considerable energy towards voice acting and framing scenes. 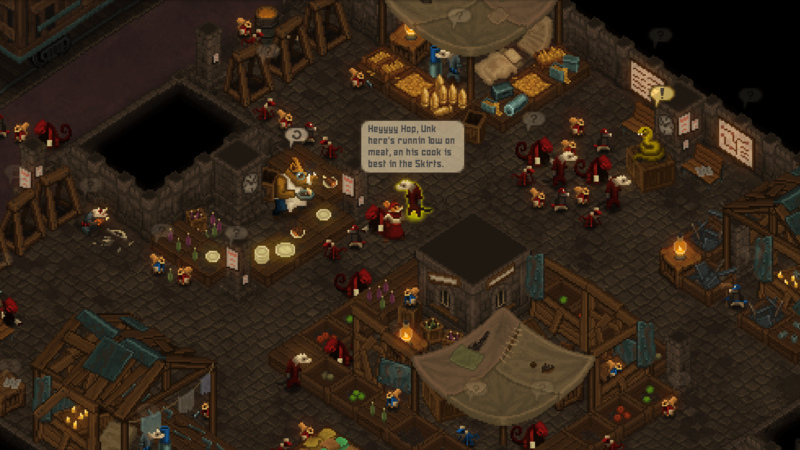 However, by working within limits, Tooth and Tail is captivating in its simplicity. Each of the four main leaders have a limited number of lines. Each line, therefore, elucidates their motivations and struggles. Through a handful of prompts one can understand both the lead-up and the devolving conflict itself, and it’s through our limited exposure (each section is only six missions long) that creates the ambiguity that feeds into the burgeoning tension and intrigue. The Long Coats and Common folk are obvious allies in their opposition to the Civilized, but differ in their end-goals. The KSR demands order, and therefore protect the Civilized, yet share an adoring respect of the ruling Tsarina with their enemies. And every sub-faction and unit has their own interests and susceptibilities that splinter them. Idealism and the harsh reality of food-scarcity are at odds. It is easy fill a story with plot twists and overt realizations. However, this title side-stepped overwrought dramatics while maintaining salient themes. Tooth and Tails concisely explores a multi-faceted world, and culminates in probably the most creative and captivating final mission I’ve ever played in an RTS. 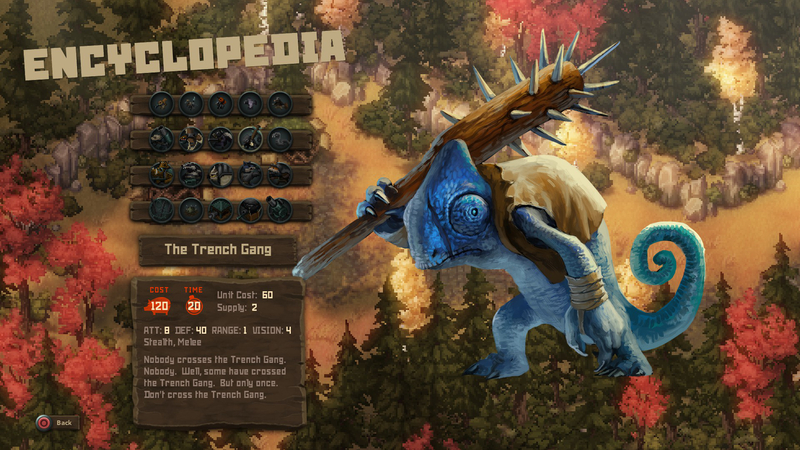 Tooth and Tail is available on Steam and the PS4.